English Setters normally live to ten years of age, but in the right environment and given the right nutrition will live up to 12 years of age. The female usually weighs about 25kg and is 61cm tall, with the male being about 35kg and 68cm tall. English Setters are intensely friendly by nature. Well mannered with other dogs, and loyal and affectionate by disposition, this breed is ideal as a companion for adults and children. 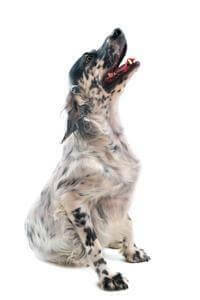 English Setters are truly reliable in temperament, so thoroughly deserve the honour of being called 'the gentlemen and gentlewomen of the dog world'. A well-known television programme places them in its Top Ten of recommended breeds. This is a dog that thrives on human contact, so English Setters will not take happily to being left to their own resources for long periods of time.